Gennadi Ushakov, speaking to Sport Express, confirmed that Evgeni Malkin did sign a new deal with Metallurg Magnitogorsk on Sunday which will have Malkin play for one more year in the Russian Super League. Absent from yesterday's news reports on this story were any comments by Malkin's Russian representation or by Malkin himself, only the statements of Metallurg management. However, Ushakov, who is one of Malkin's agents, was quoted today as saying, "I can now say concretely that Malkin will remain with Magnitogorsk for one more year." Explaining that Malkin's side held back from commenting on the deal until the official signed copies had been released, Ushakov also revealed that Malkin's new deal does not contain an "out clause" that would allow Malkin to leave for the NHL after the season has already started. Ushakov described Sunday's negotiations as difficult in that Malkin "seemed detached, and had already been mentally prepared to leave for Pittsburgh", though he claims that there had been "no arm-twisting" during the negotiations, which both of Malkin's parents were on hand for. 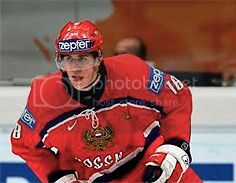 Ushakov added that Malkin's parents insisted only that that the conditions of the deal would be "comfortable" for their son, and that they were satisfied with the result. So, did the Russian mafia make him an offer he could not refuse? Did they promise to make his father look like Sonny Corleone? The original article (in Russian) comes across as more sincere than slimey, but I gotta admit that as I was typing up the few quotes that I pulled, I thought, "This sounds a bit shady now." Is there any word on terms? My guess would be that he took less money in order to get out of the second year of his old contract. Or maybe something really strange is going on. I haven't seen any dollar figures as of yet, and you almost never will with Russian contracts-- other than generalizations like "above 500,000", or ballpark-type statements like "I can make as much in Yaroslavl as I would've in Vancouver." Russian contracts include side benefits and under-the-table perks, too, like housing and cars, which makes them harder to quantify. The owner of Metallurg Magnitogorsk is a multi-billionaire (literally $3 to $5 billion). I'm sure that Malkin's being well taken care of. The way I see it, Malkin's deal serves both sides. Malkin could've tried (and still can, I suppose) to run away from his Russian contract via loopholes, but that's messy, and people could get hurt that way. So, he compromises, offering to stay one more year in order to get the last two years of his deal lopped off, and everyone is saved the extra hassle. Plus, Malkin just turned 20 about a week ago, so he has time on his side. Sergei Gonchar had offered his home to Malkin - to live with his family - if he came over the NHL this season, so I guess they've talked a bit. Anyway, this is what Gonchar said about a conversation with Malkin he had the other day: "He told me he's staying another year. He said he has a reason to stay over. I don't know the reason, but he's staying now." Wow, that's a really crucial quote.